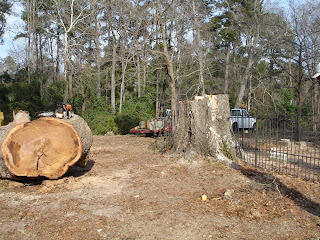 On January 10th, 2009 the old tree had to come down. 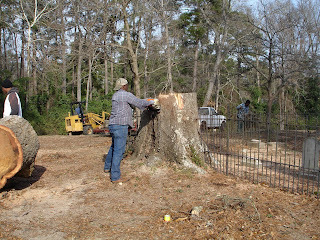 Read the story about the history of this massive old oak! Most folks love trees. When you see a massive old oak tree you wonder what that tree has seen in it's life-time. 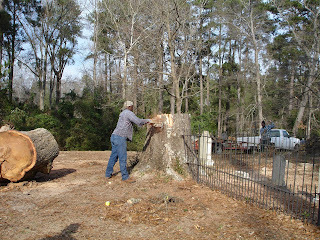 For one such tree located in the Fuller-Murrell Cemetery, I have recently learned how it came to be so long ago, in December of 1884. This tree is now 124 years old and it is sad to say that it may be at the end of it's life because of disease, decay and it's potential of doing damage to the remaining headstones that it has shaded for over 100 years. I am now going to tell you the history of this tree and how because of one person this tree has become a part of history. In 1880, my sister Maggie (Margaret Rebecca) married and moved to Pittsburg, Texas and in 1882, sister Mamie married and moved there too. We four younger children, Alice, Lena, Ettie and Rawlins, joined them in 1884. Brother John had married Ella Warren and was then living in Minden. I well remember the last time we, with the help of Walter and Carrie Spann, Jodie and Rush Farrier, Walter Crichton, the Fort's, and Dr. Harrell's boys, cleaned the cemetery before we left for Texas. It was December 1884. We dug up everything and had a good day cleaning up. I found a little oak tree about as big around as a match and about ten inches long with about four leaves at the top. I pulled it in and out of the iron fence to protect it, for I knew that it would be a tree by the time we were grown. Years later I again saved the oak tree. Someone wrote asking permission to cut it down, as "it had grown through the fence". I wrote back and quoted Joyce Kilmer's immoral line "Only God can make a tree." So the tree still stands through the fence. The Murrells, my grandparents, came to Claiborne Parish in 1818 and lived near Homer, Louisiana, where they are buried on the old farm. Quite a few slaves were buried there too but now the graves can hardly be separated. A"Hardshell" Baptist Church was built nearby, which later burned down and the congregation of the church moved to Athens, Louisiana. I have so many, many pleasant memories of my early childhood days in Minden. How we had to pull through the deep sand to the old college, which then was a frame building and now has been replaced with a brick one. The happy days we had with the Spanns, Farriers, Gleasons, Flemmings and others, who all lived near our home. But times change and people must move on. The Fuller-Murrell Cemetery is located in the 800 Block of Gladney Street in Minden, Louisiana. The Murrell, Fuller and Harper families used this cemetery from ca 1842 until 1902.